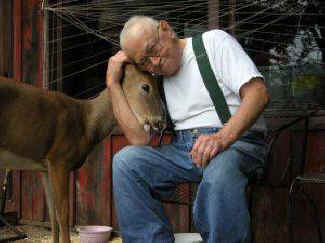 My handyman, Skip, who killed deer for 30 years, had accompanied me to meet two of the friendliest buck fawn babies when I needed a few nails from Carl’s supplies. When they ran up to him, sniffed his hands and looked up adoringly at him, Skip said delightedly, “Wow — I have never been so close to a deer.” I suggested maybe if he had met a deer before he started killing them, killing would not have been an option. After a few minutes with them, he said I might have a point. He has not hunted since. I met Carl Drake shortly after my father died in 2008. I was out walking my border collie during the deer kill. A large GMC truck towing an enclosed trailer was slowly moving up the road and stopped beside me. Carl was out searching for the young buck he had raised the year before. He had put a red collar on the little guy when he released him, hoping hunters would not kill a tame deer. Carl had already visited the DNR offices in Madison to buy a deer license to tag the deer as his deer — but a living deer. The DNR staff laughed in his face. If you do not kill deer, you have no right to deer — and no right to help an orphan fawn. He was denied. That young buck survived the first winter, but was killed just outside of Carl’s house the next year as word had spread that a tame buck was vulnerable there. Carl lives at the end of a cul-de-sac on a beautiful property directly on a fork in the Big Slough in Columbia County. He built two gypsy wagons on wheels directly over an artesian spring for rescued chickens, ducks and geese. Jess was the gray goose he doted on. There were a pair of white ducks (one with only one eye), a crippled wild duck, and various roosters, chickens and doves he kept as pets. Every year that I knew him, there were one or two orphan deer brought to him for help. One young girl, slim and delicate as the tiny fawn she brought, had found the baby while mushroom hunting. Her hand grazed the fawn, barely breathing. She scooped up the little one and took her home. That night she dripped fluids down her throat. Over the next few weeks, the fawn developed an extraordinary attachment to this young woman. So when she dropped the little deer off at Carl’s, the fawn refused to take a bottle from him or anyone else. She would look hopefully at me when I rounded the house on a visit — but realizing I was not her special person would lapse into despondency. Carl ended up asking the young woman to return every other day to bottle feed this baby. When her rescuer arrived, the fawn would guzzle down a couple of bottles of calf-milk replacement, and cuddle up to sleep, relieved, nuzzled against the girl. Carl became expert at taming little raccoon orphans. He built a raccoon condo over to the side of his lawnmower shed. The babies would start out on the back porch, tough and spitting mad little grumpies. He would have them tamed with food in two days. One year 14 of them arrived in twos and threes. They would reach their leathery monkey hands out for treats and you could massage those sweet little paws and they would purr. When he released them they were like exuberant popcorn, busting with new freedom. Pictured is Carl with his last doe. Look carefully. You will see she is grooming him, a bonding reserved for family. Carl was diagnosed with stage four bone cancer a few months ago. Shortly after he received the diagnosis, with this doe still in the enclosure, Carl noticed an unmarked DNR truck coming down the road. He ran back (even though he is pretty crippled), opened the deer enclosure door and hobbled back to his chair. He was watching TV when the wardens rapped on his door. Carl: “Well, let’s see if she is in there.” The deer was lying outside the enclosure. Carl removed the door but his doe hung around the house like a faithful dog. She took to visiting Carl’s neighbor Pat, Pat’s hunter husband, and their golden retriever Penny. Unfortunately not everybody gets a neighborhood Carl. But when Carl reaches the rainbow bridge we all will cross, I suspect he will be welcomed by a lot of beautiful spirits who knew shared joy because of a good neighbor.